We have a new pet! It is alive and lives in our refrigerator, and needs to be fed at least once a week. Today most yeasted breads are made by adding instant yeast or fresh yeast to do the dough, easy to use and allowing a fast rise. Originally, yeasted bread was made with sourdough. 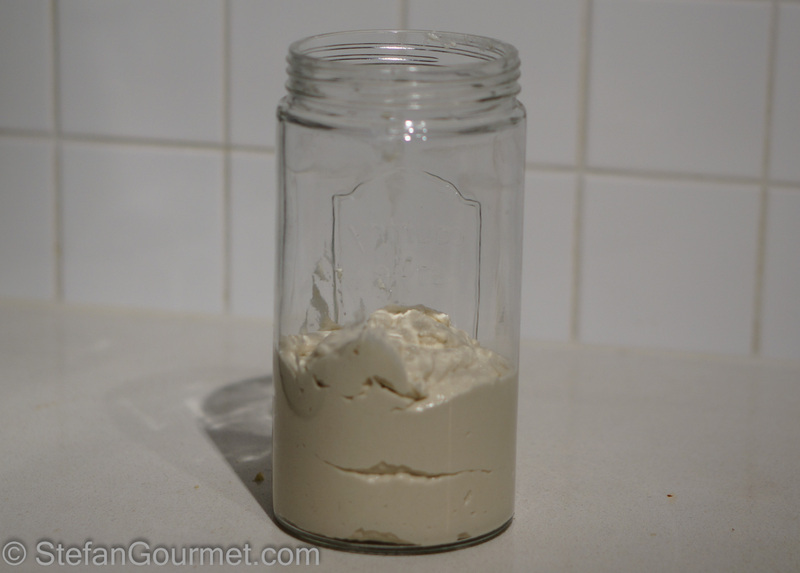 Although a bit laborious, it is fairly straightforward to make your own sourdough starter. The cool thing about this is that it will be your unique starter, using the natural yeast and conditions of your kitchen to develop it. My first encounter with sourdough bread unfortunately turned me against it for quite a while. This was German sourdough bread: tough, dry, dense, and with a sour taste. No offense to Germans, but if you are used to Dutch bread then it takes quite some getting used to. (This also goes for the amount of salt in bread by the way. If you’ve ever been to Tuscany, you know what I mean.) And so for a long time I thought all sourdough bread was like that — even though I had different types of sourdough bread without being aware of it, like French bread for instance. After having some really good sourdough bread at a number of different restaurants, I decided it was time to look into the subject. I found out that it is very simple to start your own sourdough: simply mix flour and water, and leave it for 48 hours. Under the right circumstances (i.e. room temperature, preferably a little warmer) the yeast and lactobacilli that are naturally present will start to grow. 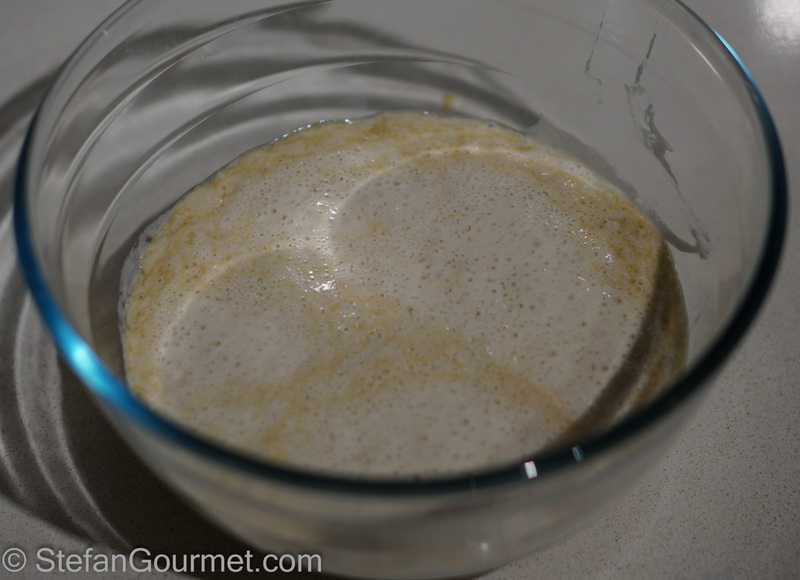 Next you need to ‘feed’ the sourdough starter every day for 14 days. 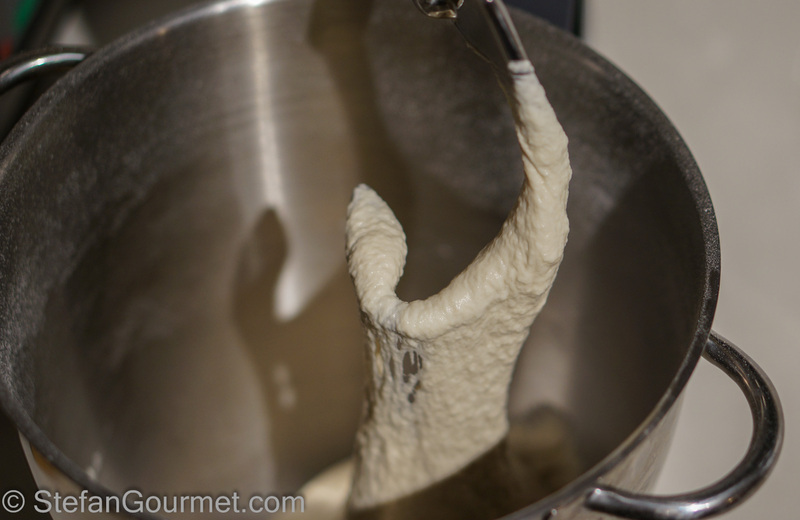 This is the laborious part, as the starter will become extremely sticky and hard to work with. But after that you will be rewarded with a stable sourdough culture that you can keep in your fridge forever, as long as you feed it once a week. Despite the fact that it is cool to bake bread using your own sourdough starter, it also tastes better than ‘normal’ bread and has a better texture. The bread I’ve made with it so far has been only very mildly sour and had a wonderful soft texture — not at all like the tough German stuff. More about sourdough bread in the next post. 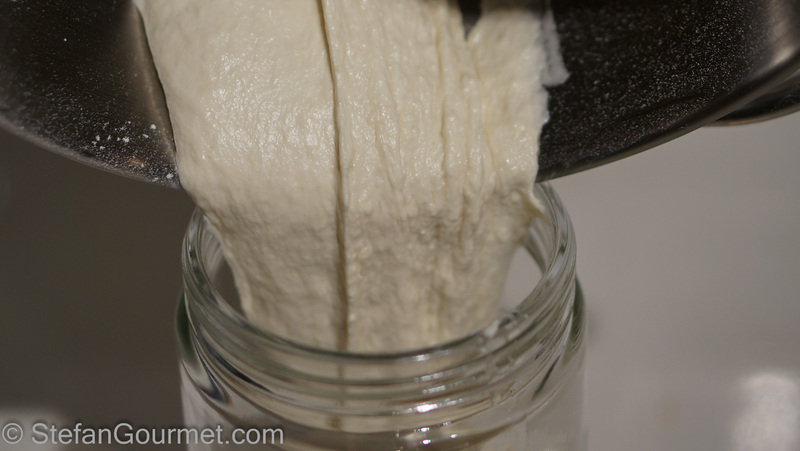 First, let’s look at how to make your own sourdough starter. 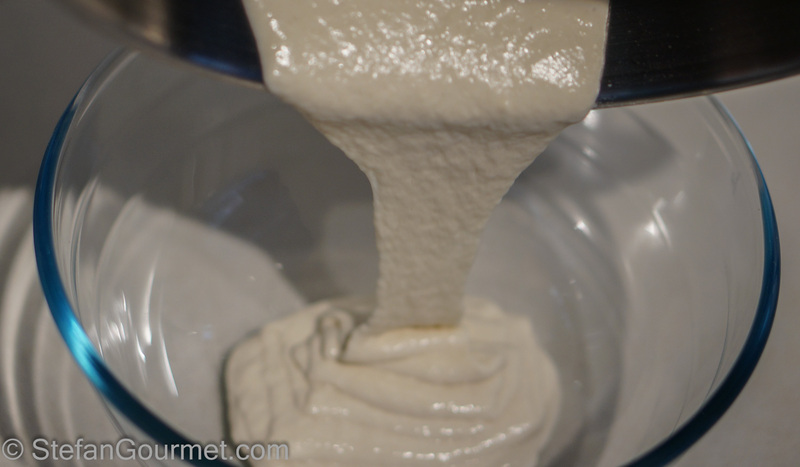 Apart from the conditions in your kitchen, also the time between feedings and the ratio between flour, water, and the ‘old’ starter will have a big impact on your sourdough starter and can make it more or less acidic among other things. I have based my sourdough on an Italian recipe from GialloZafferano (although I did make some changes). I love the Italian name for it by the way, lievito madre, meaning “mother yeast”. 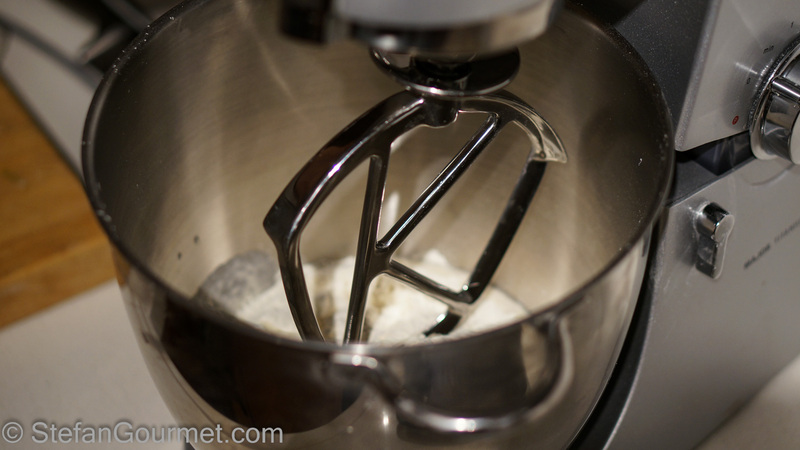 Combine flour, water, and honey (if using) in the bowl of a stand mixer. 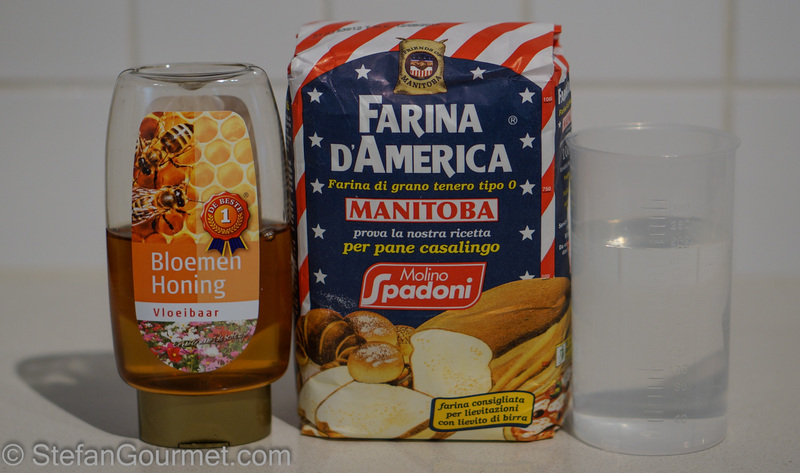 The honey isn’t strictly necessary, but since I started in winter at lower temperatures than ideal (26-28ºC/79-82ºF), I thought a bit of extra food for the microorganisms would be nice. Mix with a paddle attachment until well mixed. After 48 hours you should see bubbles and funky colors and it should smell pleasantly acidic. If not, start over. Remove the top layer with the funky colors. Now we are going to feed the starter for the first time. 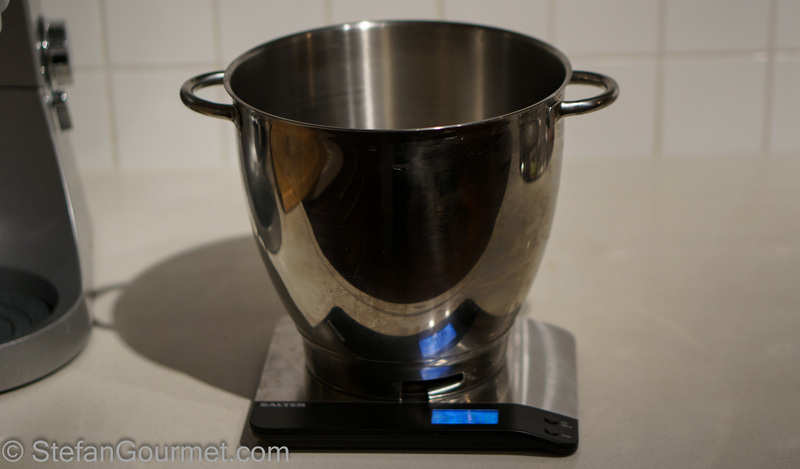 Put the bowl of the stand mixer on the scales and reset the weight. 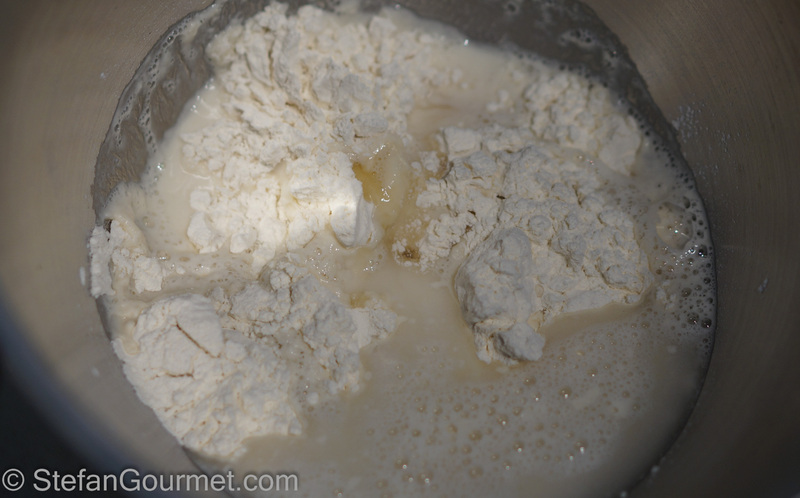 Add 200 grams of the mixture from the bowl. Discard the rest. Add 200 grams flour, i.e. the same weight as the starter. Add 100 ml of water, i.e. 50% of the weight of the starter. Mix with the paddle attachment. 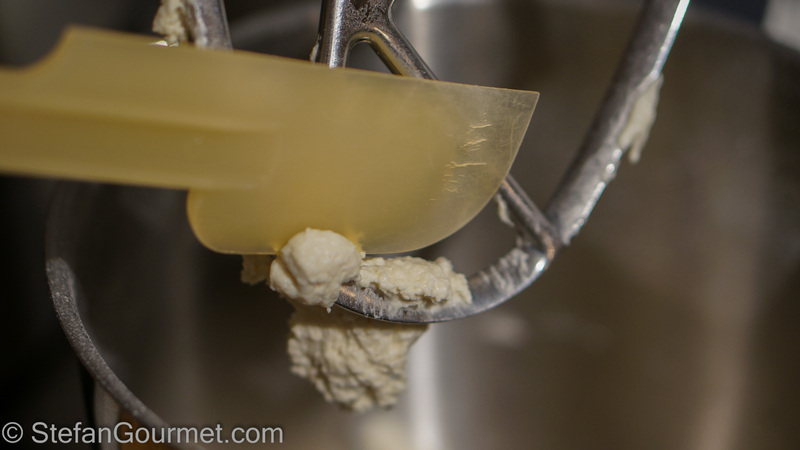 …and replace it with the dough hook. Knead for 5 minutes. Transfer the new starter to a suitable container. A suitable container is transparent (so you can see what is going on), of non-reactive material (i.e. glass is a good choice), tall and narrow (so the starter can grow uniformly) and big enough to allow the starter to quadruple in size. Cover with plastic wrap and puncture several times with a toothpick. Allow to rest at room temperature for 24 hours, then repeat the whole process. Do this for 14 days in a row. You will notice that the starter will become more active with more bubbles. 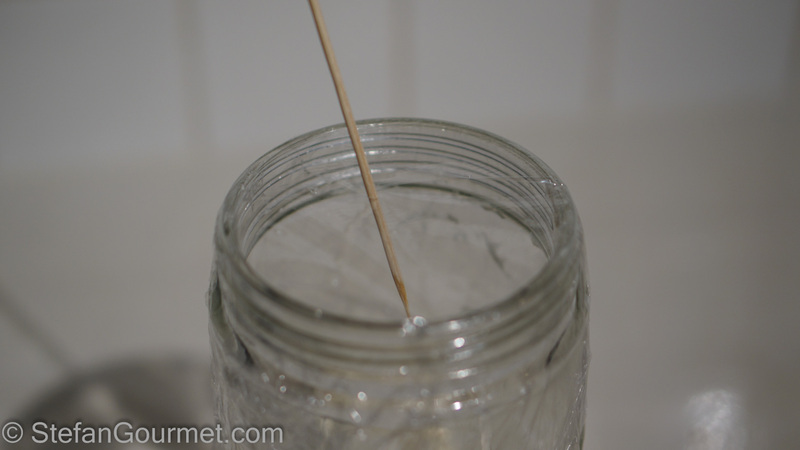 You will also notice that it will become less sticky and easier to handle. Simona pointed out that you can mark the starting height of the starter in the glass jar with an elastic band, so you can see how much it grows. According to her, it is a rule to do this when Italians make lievito madre. For each feeding, first discard the top layer of the old starter. Then measure out the correct amount of starter and discard the rest. Clean the container with hot water only and dry it well. Keep checking the smell of the starter, which should remain pleasant and only slightly acidic. After a few days I decreased the amounts to 150 grams starter + 150 grams flour + 75 grams water as I thought it was a waste of all that flour to keep doing it with 200 grams. 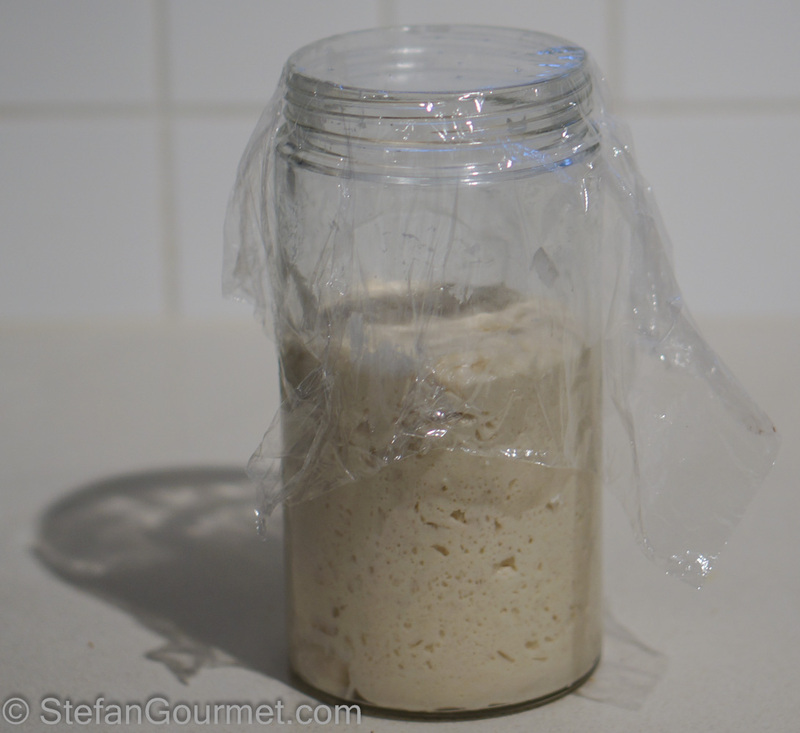 After 14 days, the starter will be growing a lot overnight and is ready. You can now use it to bake bread, more about that in the next post. 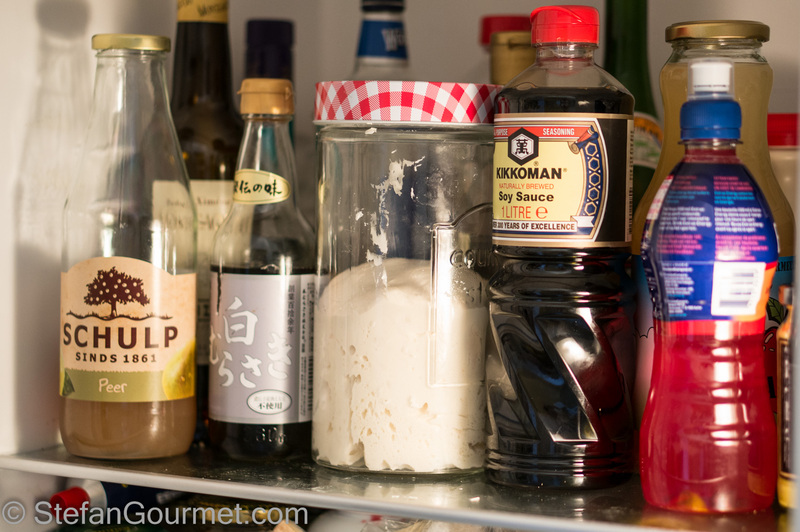 To keep the starter, close it (with a lid or plastic wrap without airholes) and refrigerate. You will notice that the starter will grow at a slow rate, and after a week it will stop growing. That means it is time for the next feed. Pork with sweet and sour onions is one of Biba Caggiano’s recipes from the region Emilia-Romagna. Separately they are both good, but together they are delicious. You can roast the pork in the oven, or cook it sous-vide. Thanks for the great, straight forward tutorial…your photos certainly help take out the guesswork! Hi, Shanna! Good to see you are slowly returning to the blogosphere. I hope you’ll have time to bake again soon! You’re nothing short of amazing my friend !!! I will be trying this, for sure! I’m from Germany and really love German bread, so let’s see whether this will turn out just as good! If you have grown up on German bread, you will probably always prefer that. But if you like French bread and the like, you may like this as well. Hi Stefan! I’ve been reading (and loving) your blog for a while now. I found it by looking for sous-vide recipes. Next, you should always “backup” your starter. I do this periodically, especially when it’s good and sour. 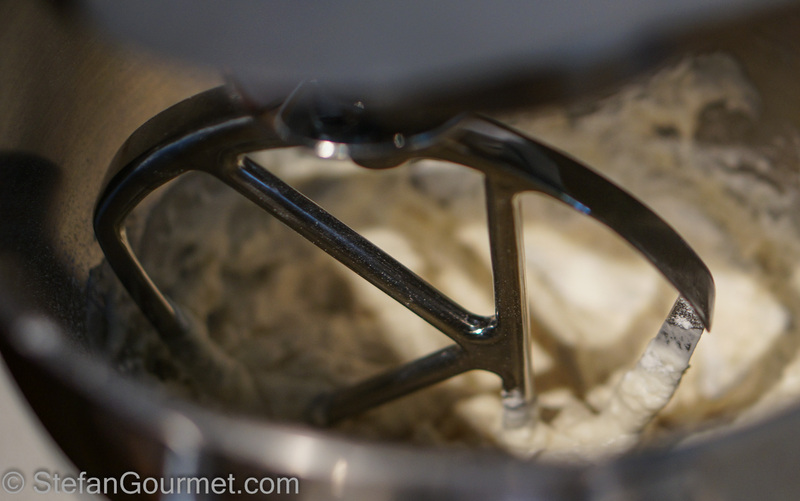 If something happens to your starter, you use the backup to start it up again! Here’s a link with directions. Thanks Jena, for taking the time to leave such a thoughtful comment. I checked out the recipe for crumpets, they seem similar to our poffertjes. I’m not sure if the starter discards in those first 14 days can be used for this? Now that my starter is stable, I never discard anything because I always use it to bake bread! The backup sounds like a good idea for when I go on a vacation when I can’t find anyone to feed my ‘pet’. Starting all over with the starter certainly does not sound like something I’d look forward to. As you came here looking for sous-vide recipes, I’m curious if you’ve tried any sous-vide recipes from my blog? What is your favorite food to prepare sous-vide? 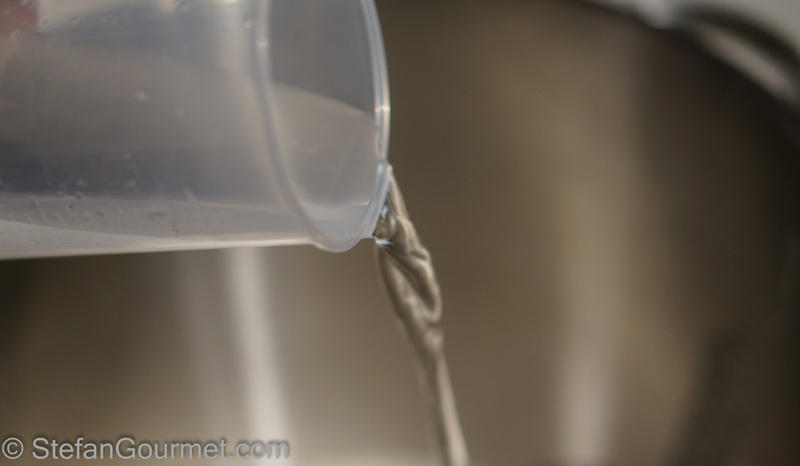 Have you been sous-vide’ing for a long time already? I would give the discarded started from the 14 days a try. It may not be as sour as the starter will get, but they will surly be tasty! I have done your beef short ribs sous-vide and they were wonderful! This coming week I’m going to use the technique you use in the smoked brisket recipe on a pork loin. My favorite sous-vide recipes are Lemon Curd, Garlic confit, and any kind of steak. For the lemon curd and garlic confit I sous-vide them in sterilized canning jars – no bags needed! I just bought a chamber vacuum and I can’t wait to start using marinades and other liquids in my SV machine! I think it will be perfect for making Creme Brulee. I’ve never regretted getting my chamber vacuum sealer, it is wonderful. I’m sure the smoked/sous-vide pork loin will turn out wonderful. The combination of smoking and sous-vide is one of my favorites. Great Job Stefan!! You have inspired me to make my own pet today!!! Great! The first 14 days are the tough part, then the real fun begins. Great – looking forward to becoming a parent!! Hi Susan, thanks for stopping by and taking the time to comment. The trick you describe is called a “polish” by Italians and it is made to bake ciabatta. Well done – and welcome to the great world of sourdough breads! Thanks for the tips. I wonder if your starter with the higher hydration is stickier than mine? Nice idea to ‘adopt’ a starter, although I suppose it will need to adapt to a new home. 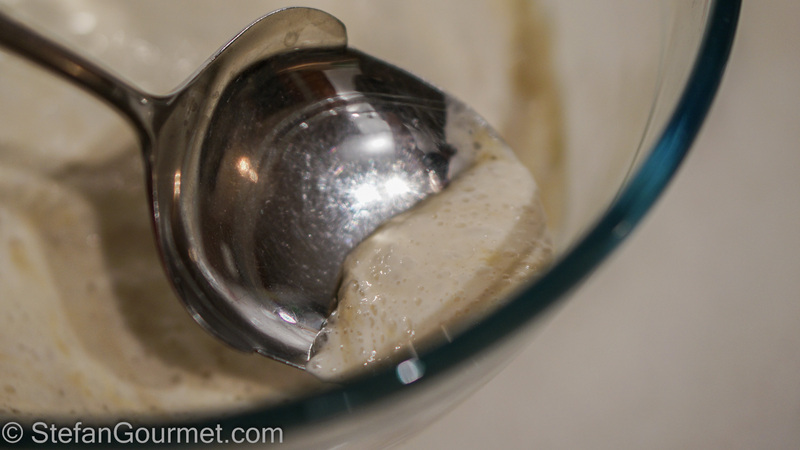 I wouldn’t say “sticky” as such – it is more like a porridge! 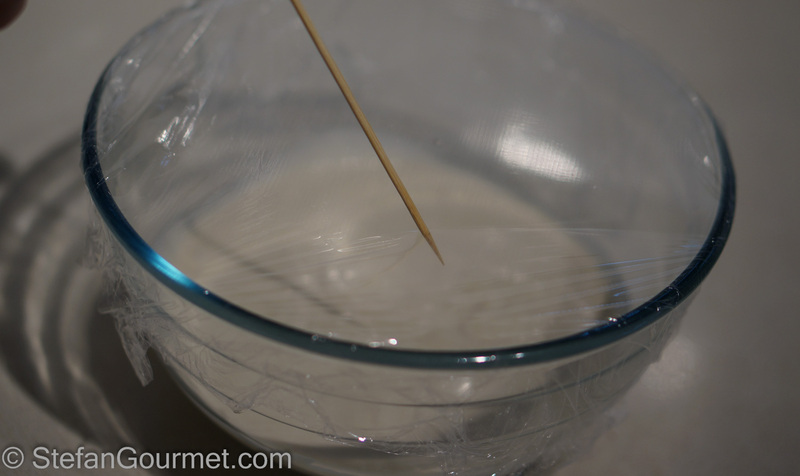 I dollop out 100g of it for each loaf (750g or 1000g) and mix with the liquid before adding flour. It lives in the fridge during the week, and will survive for several weeks without feeding if necessary, though it does then need “reviving” a bit. I keep around 200g I guess of starter in the fridge, chuck around 100g when I’m ready to refresh and add 100g flour and 100g water. 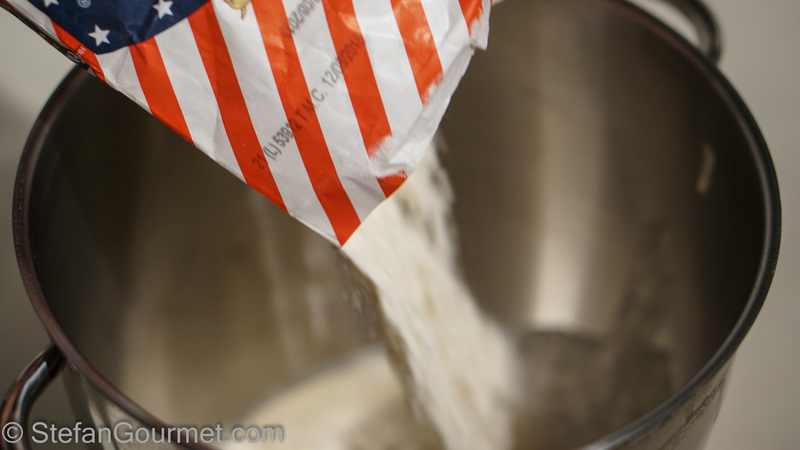 I don’t bother to weigh the starter before refreshing – just make sure I add the same amount of water and flour. From time to time I make a new starter. I don’t throw out the old but once the new one has been fermenting for 4-5 days I’ll refresh both and see which is more vigorous. I’ll use the less vigorous one in crackers or pancakes. Maybe I’m missing something but I’ve found starters a lot easier than described here: 1 cup flour (must be whole wheat organic) 1 cup water (must be either really well filtered,or distilled- water’s version of organic) gives you a 166% mix. In it goes into a 1L jar and sits covered 4 days at room temperature. I refresh it once and start using it. In helping others with their starters I find that the quality and purity of the flour and water are critical. Interesting approach. The reason for daily refreshings for 14 days is to obtain an equilibrium in terms of micro-organisms and acidity in the starter. This will make for more predictable results. I’m pretty new to sourdough, but when I got impatient and tried to use my starter sooner, it wasn’t vigorous at all. Here tap water is as clean as bottled water and does not have chlorine like in many other places in the world. I can imagine that chlorine would mess with the starter. Just to make sure what I said was correct I put up a new starter. 1 cup each of flour and water. In a covered mason jar. After 36 hours it was foaming away. I had to put it in the fridge where it will stay until I need it. You must have some special location conditions if it works like that every time. 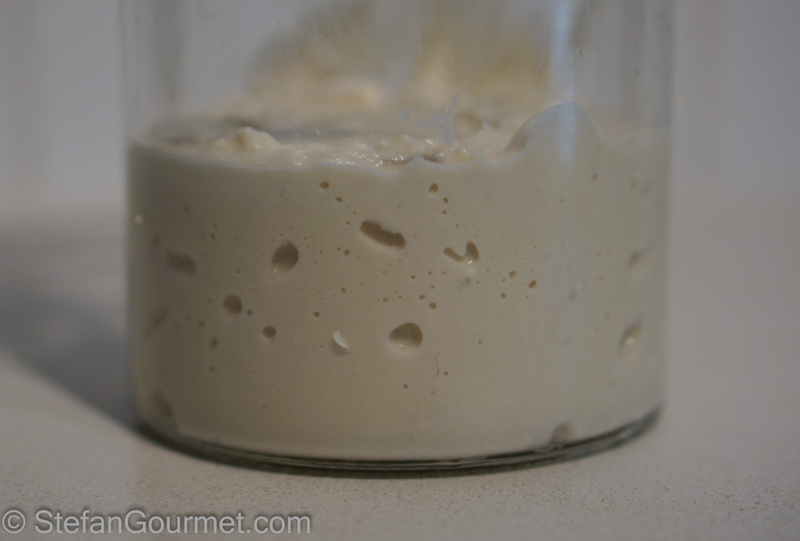 I am not very experienced with sourdough starters yet, but according to the research I found online it takes a while for an equilibrium to be established. The equilibrium factor is why I stuck it in the fridge for a while so it can sort that out. As for special conditions – I would say 2: fresh organic 100% whole wheat flour, and water that is reverse osmosis filtered. It wouldn’t be any special yeasts floating in the air because I kept the developing starter in a glass bottle with the lid firmly screwed on from the beginning. As I keep mine at 100%, it gets hungrier quicker – so I don’t think I could leave it out for 4 days – it refreshes ready to use in about 4hours in summer and 6 hours in winter, it would be starving after 4 days! I use strong white bread flour, though sometimes will use wholewheat to refresh if I want WW in the recipe. It goes even faster then though! Also I use weights rathe than cups, as cups can vary depending on the level of humidity, how much it is packed down etc – it isn’t particularly difficult. Water where I am is a bit chlorinated but it doesn’t seem to be a problem! I was just referring to the rare time when I need to create a new starter. Otherwise it’s always in the fridge. Its the only time I use volume too though I should really test that one. While I keep the 166% starter I also prepare a 117% preferment (equal weights of starter water flour) that I use for the actual bread. 3 weeks? naah – refresh it the day before you go and leave it in the fridge. It will be fine. Stefan, our dog guards the house and takes less feeding and attention than your starter. If Lucy wasn’t looking, i’d trade the hound for this. Due to an unplanned circumstance, i will not be able to feed and change my starter days 8-11. Must I start over or can I store in the refrigerator during this time? 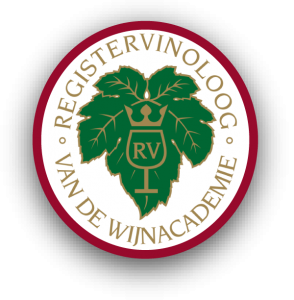 The process has been successful so far – beautiful growth, bubbles, etc. Very aligned with your pictures. The smell is mild and seems like lemon juice/alcohol. Unclear if this is what you mean by pleasantly acidic? Great that you are making your own lievito madre. Although I haven’t tried this, I’m pretty sure you can store it in the refrigerator for those 3 days. Of course they don’t count. As long as the smell is pleasant, it should be okay. You mention lemon juice, so that would fit with pleasantly acidic. Thank you, Stefan. I will try the refrigerator and let you know how it works. And, of course, the results of my first loaf of bread. The smell seems like a cross between lemon and vinegar but it is very, very mild – more of a slightly sour smell. I must admit I don’t normally find an acidic smell to be pleasant, even when mild, so I’ve struggled to with the ‘pleasant’ element of this 🙂 The raise and texture of the lieveto is quite nice though. Any other guidance on what it should ‘smell’ like? It will be smelling more strongly after some more days of refreshing. I am not sure how to describe it in a way that will make sense to you, also because the yeast that was present on your flour is different from mine. If it grows like you said, it is most likely alright. This is very helpful Stefan. It is definately not moldy in smell or otherwise – i understand your description more clearly now. I will let you know how everything turns out with the refrigeration in two weeks or so. Have a wonderful weekend – thank you for all your help. Stefan good morning, good afternoon. My apologies but another question please. Last evening my starter did not quadruple as it had the days past. It had nice bubbles but the increase in size was only 30% and perhaps the house was too cool last night given changing temperatures here. I decided that I would feed it again at the 24 hour mark vs. throwing the starter out, and at least see if it would grow again. Smell and color were fine. 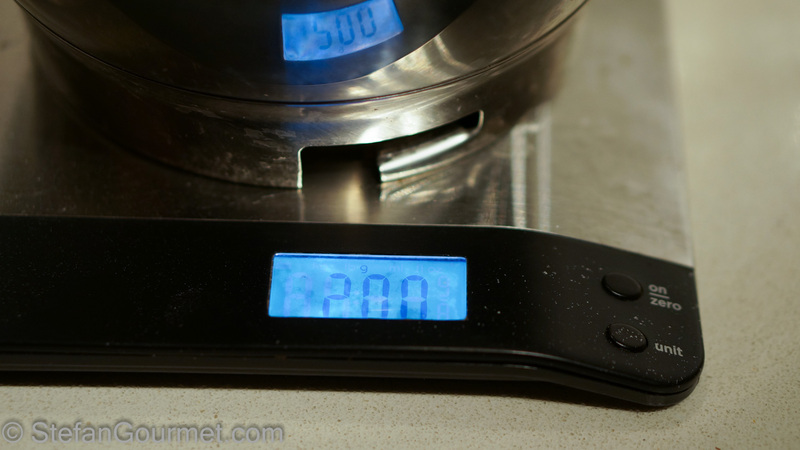 I made an error, I used 250 grams of starter, 250 grams of flour and 250 ml of tepid water vs. 125 ml of tepid water. I realized this after I fully mixed the materials. Can it be saved with additional flour? Or should I simply start over from scratch based on your experience. Thank you so much for your patience and counsel. You can try saving it by adding extra flour. You then may have to wait 36 or 48 hours. And you may have to continue the daily refreshing for an additional day. I just wanted to update you – I was not able to save the levito madre. I have started a new batch however and will let you know how it turns out. I really like your methods for the Lievito Di Madre!!! Yours It make lot more sense than others.I only have one question!! Can I use this Lievito di madre for making some Italian sweet bread? I think I can because in Italy they use lot of the Lievito di madre to bake bread and some sweets. Thank you so much!! I will keep you posted with my starter. Hi Tina, yes you can use it to make sweet breads. Good luck and let me know how it turns out. I have tried to cultivate my own Lievito following your recipe here. Followed exactly and it has got lots of bubble on the 2nd day and while i was trying to remove the hard crust (didn’t really have any crust), I noticed there is some hooch under the bubbles instead on top. On the bottom it’s kind of slimy. Is this normal ? Hi, when you first make it you leave it for 48 hours without stirring. Then you need to feed it every 24 hours. You stir with each feeding, otherwise no stirring. Hooch and slimy sound bad. You could always start over and make sure you keep it covered and wash your hands to avoid contamination with unwanted yeasts or bacteria.